Politicians promise to lead the country out of the worst drug crisis in its history, but opioid abuse continues to kill Americans in record numbers. Are our leaders ignoring a lifesaving solution? Over 115 Americans die every day from opioid overdoses, more than those killed in car accidents, from breast cancer or even guns. Nearly 2.5 million Americans struggle with opioid addiction, and though controversial, some people believe a potentially lifesaving solution may lie in medical marijuana. In the fourth installment of his groundbreaking series, CNN chief medical correspondent Dr. Sanjay Gupta takes an in-depth look at marijuana’s potential as both an alternative to opioids in treating pain and in ending opioid addiction. WEED 4: POT VERSUS PILLS will air on CNN, Sunday, April 29th at 8pm ET. In the special, Gupta meets pioneers in the field of pain management as well as addiction research who believe that marijuana is the next best hope for treating both. He also speaks with those who have struggled with addiction including an exclusive interview with NFL running back Mike James. In 2013 James suffered a devastating leg injury during a Monday night football game. He was given opioids after surgery to treat his pain, and months later he found himself addicted. Scared and worried, his wife suggested he try marijuana, a drug that is banned by the NFL and could cost any player their careers. Today, James is making history as the first player to file for a therapeutic use exemption for cannabis with the NFL. Many states have begun to take steps toward cannabis as a possible alternative in stopping the opioid crisis that has crippled their areas. Gupta visits Maine where lawmakers and residents are committed to cannabis as a way to get people off opioids. He speaks with a woman who is opening a rehab center where she will use cannabis to wean patients off of opioids. He also talks with several state legislators who are working to change the laws and allow those addicted to have access to medical marijuana. As the state of Maine looks to cannabis as a possible solution, many lawmakers, as well as Attorney General Jeff Sessions, continue to fight changing the scheduling of marijuana, which would allow for further access and research. Gupta delves into the history of how marijuana became a Schedule I drug, considered equal to heroin, LSD and ecstasy, while cocaine, methamphetamines, and many opioids including OxyContin, fentanyl, Dilaudid and Vicodin are Schedule II drugs. He talks to several advocates and critics about research behind their positions. 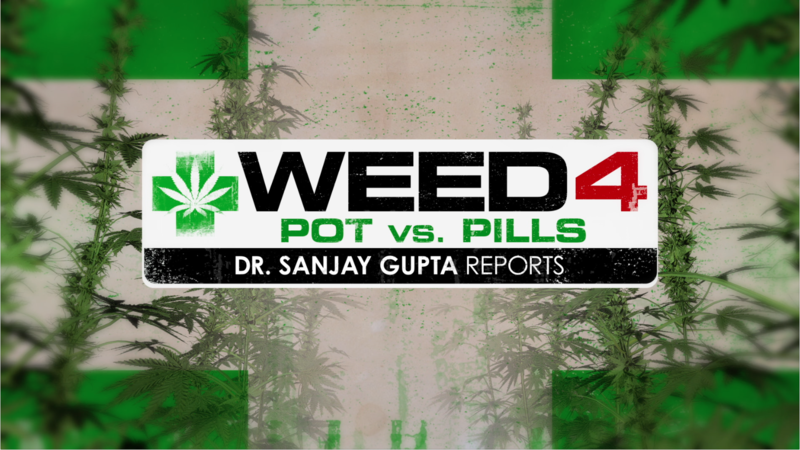 WEED 4: POT VS PILLS will stream live for subscribers on Sunday April 29th via CNNgo (at CNN.com/go and via CNNgo apps for Apple TV, Roku, Amazon Fire, Samsung Smart TV and Android TV) and on the CNN mobile apps for iOS and Android. The documentary will also be available the day after the broadcast premiere on demand via cable/satellite systems, CNNgo platforms and CNN mobile apps. Weed 1-3 is now also available for subscribers via CNNgo (at CNN.com/go and via CNNgo apps for Apple TV, Roku, Amazon Fire, Samsung Smart TV and Android TV) and on the CNN mobile apps for iOS and Android.